Novartis and Amgen have both been trumpeting their fast-growing migraine drug Aimovig in public, but acrimony behind the scenes is now spilling out into the law courts. Amgen has filed a lawsuit accusing Novartis of breaching their partnership for CGRP inhibitor Aimovig (erenumab) and seeking to terminate their 2015 contract, which gives Novartis co-marketing rights in the US as well as commercial rights elsewhere with the exception of Japan. In response, Novartis has filed a lawsuit that accuses Amgen of inappropriately trying to end the alliance, saying it has spent “hundreds of millions of dollars” on the collaboration since the deal was first signed, and accuses Amgen of trying “to keep the Aimovig profits for itself and deprive [Novartis] of its contractual right to share in the product's success and recoup its significant investments”. The core of the conflict stems from an agreement between Novartis and Alder Biopharma, which is developing a rival CGRP inhibitor for migraine called eptinezumab that has recently been submitted for approval in the US and is heading for a possible launch in the first quarter of 2020. Novartis has a contract manufacturing agreement with Alder via its Sandoz subsidiary to produce eptinezumab which dates back to 2015, but was recently extended to 2023, apparently to ensure that Alder has the capacity to supply the drug at commercial scale if approved. Amgen’s position is that deal amounts to a breach of contract as Sandoz was helping to “develop, commercialise, and manufacture” eptinezumab, and further claims that Novartis refused to exit the agreement when requested and has committed to “future manufacture of the competing product”. Novartis, on the other hand, insists that the contract is being phased out over the next five years, and in any case Sandoz’ role as a contract manufacturer means there is no conflict of interest. “The immaterial contract manufacturing services being provided by an entity that is part of a separate division from Novartis Pharma are not ‘distracting’ Novartis Pharma from developing and commercializing Aimovig,” it says in the lawsuit. Regardless, the conflict weighed on Alder’s share price yesterday, as investors worried that the supply arrangement could be jeopardised by the legal dispute with Amgen, and about the time it would take to transition to and validate a new supplier. As recently as Alder’s fourth-quarter results call towards the end of February, the company’s chief executive Bob Azelby was saying that the Sandoz agreement “will allow us to meet our forecasted supply needs at launch and beyond”. 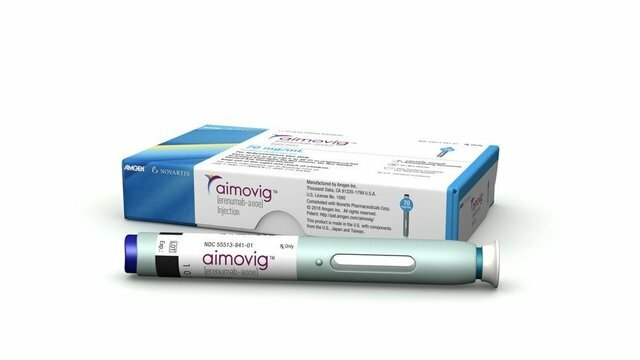 Aimovig was approved by the FDA last year as a once-monthly, self-injected preventive treatment for migraines, and was the first CGRP inhibitor to reach the market. It has since been followed by Teva’s Ajovy (fremanezumab) and Eli Lilly’s Emgality (galcanezumab), which have similar dosing requirements. Eptinezumab is set to be fourth to market if approved, and unlike the first three drugs which are administered by subcutaneous injection, is an intravenous drug that will be dosed once every three months in clinic. That profile means that it differs from Aimovig and will not “fully compete” with Amgen’s drug, says Novartis in the lawsuit. Aimovig has already got off to strong start in the market with fourth-quarter sales booked by Amgen reaching $22m, making it one of the company’s most successful launches. Analysts think the category will support multibillion dollar sales, driven by the relatively large number of people with migraine who still suffer headaches despite other therapies.